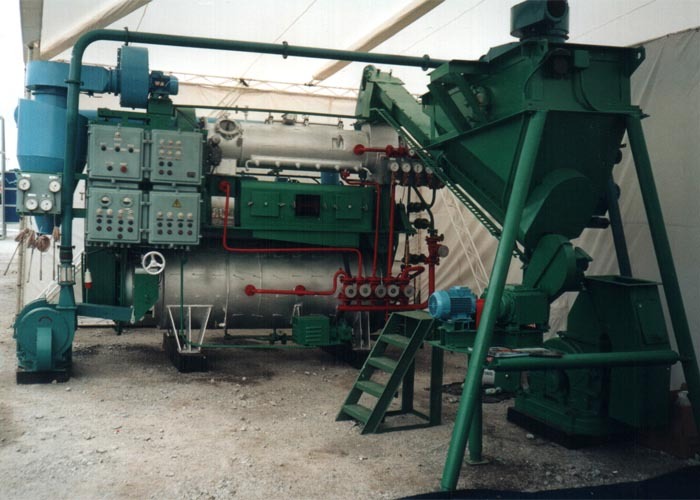 Fishmeal unit I7-IVB The unit is intended for production of fishmeal from fish waste and less valuable breeds of fish installed in coastal fish processing factories as well on board fishing boats. 2. Raw material size - pieces with mass not more than - 10 kg. Small fish is dumped into a bunker (2), big fish passes into the bunker through the chopper (1). From the bunker fish is fed by the screw-conveyer into the cooker (3). In the cooker raw material is mixed by the screw and cooked by steam. The cooked mass passes to the screw press (4), where oil and liquor are separated. Pressed liquor is evacuated outside the board. Bagasse goes to the screw-mixer (5) and is mixed with ionol. Then mixed mass passes to the dryer (6). After drying the dried meal goes to the magnetic device (7), which is intended for metallic impurities catching. Evaporated moisture is removed by air passing along the dryer and discharged into atmosphere with the help of a cyclone (9). From the magnetic device dried meal is pumped into the milling unit (8) where it is crashed and with the help of pneumatic transfer is cooled and served to the place of packing. 1. The source of water supply and purification works or sewage system. 2. Boiler room or steam generator. 3. Electro – energy source with 380 V 50 Hertz. At the moment of payment the price must be defined more exact. The factory guarantees the normal and stable unit operation. The guarantee period is 12 months from the day of putting the unit into operation. Medium resource till capital repairing is 18000 hours; medium term of service till writing off is 12 years. The industrial safety is guaranteed for the whole term of unit service.